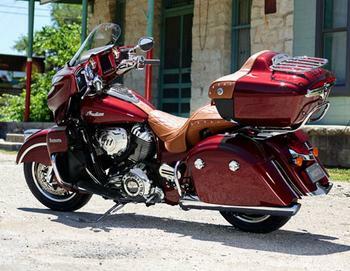 Indian Motorcycle Company is recalling 7,392 model year 2015-2017 Roadmaster motorcycles. Water may enter the trunk wiring harness, potentially causing the brake light to remain illuminated even when the brakes are not applied. If the brake light remains illuminated when the brakes are not applied, a following vehicle may not know when the motorcycle is actually slowing, increasing the risk of a crash. Indian will notify owners, and dealers will replace the trunk wiring harness with an updated harness that contains sealing plugs in the connectors, free of charge. The recall was expected to begin January 30, 2018. Owners may contact Indian customer service at 1-877-204-3697. Indian's number for this recall is I-18-01.